You know all the sounds bumble bees can make. Bzzz Bzzz, bumble bumble. 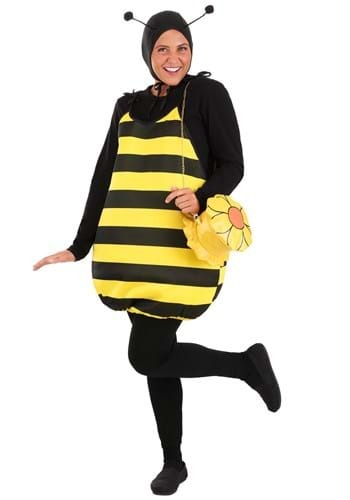 Now put them to work when you go in this classic bumble bee costume for adults! You'll be quite the buzzzzzz of the costume party. (Sorry we couldn't help that one.) Everyone envious of your black, and yellow style. With mesh wings, a stinger, and even antennae; you'll have all the bee parts needed to pollinate your neighborhood. And with the unmistakable yellow and black stripes, we're sure everyone is going to be loving the sweet pollen you've got to share! Styled as a tunic top, along with coordinating hood, you're sure to be the sweetest bee that's ever been seen. The sleeveless tunic looks great with a black shirt and tights (as pictured) but you can customize your look with other costume accessories or everyday apparel to get creative. Just top off the look with the hood, and with the antennae bobbing along, you'll be able to dance and sing, and have a grand old time. With this fun costume, you could even sing a long to the baby bumblebee sing-a-long song, or just create quite the buzzzzzz at your costume party! (Sorry, we couldn't help it again.) Just get this classic black, and yellow look from us... and get ready for pollination season!